If you are excellent at and enjoy planning big parties, like working with people, and are skilled at networking and negotiating, consider becoming a wedding planner. People who work in this field are also known as wedding or bridal consultants. Many are self-employed, but others work for wedding or event planning companies. Even though fewer people are getting married, according to various statistical sources, those who are taking this step are typically doing so at a later age. Generally speaking, couples who wait longer to get married are more established and therefore have more money to spend on their weddings. It also means that because they are so busy with work, they don't have a lot of time to plan their events on their own. They need and can afford to pay for the services of a professional wedding planner. Wedding planning requires one to be a jack of all trades. The African Wedding Guide describes what the job entails: "...the role of the wedding consultant is that of a facilitator, mediator, money manager, artisan, and constructor of dreams." If you've ever been a bride or groom, or even a bridesmaid, you also know the kind of stress planning a wedding can bring about. Add to the above description, therapist, sounding board, and even punching bag, figuratively of course, when frazzled nerves come into play. A wedding planner finds venues and vendors including invitation designers and printers, DJs, bands, photographers, and caterers, and negotiates contracts on behalf of the bride and groom. He or she deals with any difficulties that occur before, during, and after the event, making sure things go smoothly. Many wedding planners train to become event planners who then specialize in wedding planning. To prepare for this career, some people earn a bachelor's degree in hospitality management or a related field. Others do not get formal training, but, instead, learn their skills on-the-job. To succeed in this career, you must have specific soft skills— character traits you have either acquired through life experience or with which you were born. The ability to remain calm in the face of adversity is essential, as are excellent interpersonal skills. You must be a superb negotiator. As the bride's and groom's representative, it will be your responsibility to get them the best service, for example, venue, food, photography, and music, for the lowest price. Your reputation will depend on it. Your ability to network will help you get the best deals possible. Excellent organizational and time management skills are also a must. Running your own wedding planning business requires you to be adept at handling finances and promoting your business. Expertise in color, music, and flowers are needed as well. Plan to spend a lot of time reading the current bridal magazines, of which there are many, to keep up with the latest trends. Knowledge of religions is also imperative since a wedding ceremony is often a religious one. Related to this is a knowledge of customs and traditions, which are also part of many wedding ceremonies. According to the Bureau of Labor Statistics, Event planners who are not self-employed earn a median annual salary of $48,290 (Bureau of Labor Statistics, U.S. Department of Labor, Occupational Outlook Handbook, 2017). This government agency reports statistical information about wedding planners under this umbrella, but their earnings may differ slightly. 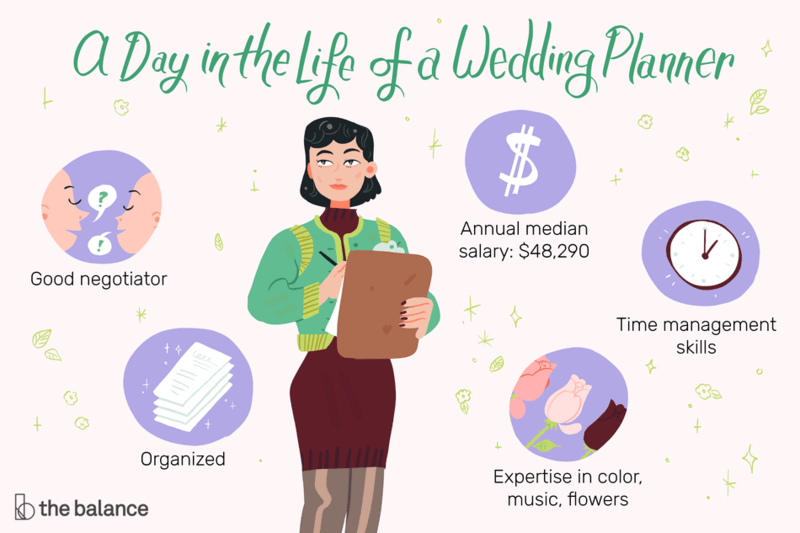 Earnings for self-employed wedding planners vary depending on their fee structures. According to The Knot, a website focused on weddings, they charge either a flat fee, an hourly rate, or a percentage of the total wedding bill that ranges from 10 to 20 percent. An average wedding costs $28,400, according to The Knot, which would mean wedding planners could earn average fees of between $2840 and $5680. Consider your start-up costs if you want to be in business for yourself. The costs of opening a wedding planning business can be under $2000, according to Entrepreneur.com, since one can work from home rather than having to rent office space or a storefront. You will have to budget for office equipment, marketing your business, and purchasing appropriate work clothing. The official organization of the wedding industry. From African Wedding Guide. Includes a very good list of necessary skills and some practical considerations.